Installing Visual Studio 2010 on a fresh machine for the first time prompts you for the password the first time you open the project, and then it works. On machines upgraded from Visual Studio 2008, you don't get this option. I've tried using the SN.EXE utility (Strong Name Tool) to register the key with the Strong Name CSP as the error message suggests, but whenever I run the tool with any options using the version that came with Visual Studio 2010, SN.EXE just lists its command line arguments instead of doing anything. This happens regardless of what arguments I supply. Why is this happening, and what are clear steps to fix it? I'm about to give up on ClickOnce installs and Microsoft code signing. sn -i <KeyFile> <ContainerName> (installs key pair into a named container). sn is usually installed as part of a Windows SDK. For example C:\Program Files (x86)\Microsoft SDKs\Windows\v8.0A\bin\NETFX 4.0 Tools\sn.exe. Most likely this location is not on the search path for your standard environment. However, the "Developer Command Prompt" installed by Visual Studio adds additional information that usually includes the correct location. This must be run from the location of your PFX file, if you have the solution loaded in VS 2010 you can simply right click on the pfx file from the solution explorer and choose Open Command Prompt which will launch the .net 2010 cmd prompt tool in the correct directory. Before running this sn command I did re-install the pfx by right clicking on it and choosing install however that did not work. Just something to note as it might be the combination of both that provided the solution. Hope this helps solve your problem. Instead of changing the password (which causes the .pfx to be changed), reselect the .pfx file from the combobox. This then invokes the password dialog. After entering the password, the project will build OK. Every dev can do this on his local machine without actually modifying the .pfx file. I'm still having problems getting assemblies to be signed on our build server machine. I'm getting the same error there, however using the sn.exe -i method does not fix the problem for the buildserver. I had the same issue and deleting the store and reading didn't work. I had to do the following. Get a copy of OpenSSL. It is available for Windows. Or use a Linux box as they all pretty much all have it. Then in the project properties you can use the PFX file. For some reason this sorted it out for me and was relatively painless! VSCommands 2010 (plugin for Visual Studio) can fix this for you automatically - just right-click on error and click Apply Fix from the menu. You can get it from Visual Studio gallery. After trying all these solutions (and a lot more), I found that the problem lies somewhere else. For people that go through the same misery as me after buying a certificate, I'll share the solution for my problem. I understand that 'sign' applies a strong name and not an authenticode to a DLL or EXE. This is why signtool will work in this case, but 'sign' in Visual studio will not work. In the past I've had experience with certificates from Verisign. They have a KeySpec=2 in the certificate - which is used with the 'sign' functionality in Visual Studio. These certificates work fine for both Visual Studio and signtool. I now bought certificates from Comodo, which have an incorrect KeySpec=1 in the code signing certificates. That means these certificates work fine with signtool (authenticode) but not with strong naming (the sign drop-down). Create a separate certificate for your strong name using sn -k [name].snk. Sign the assembly using the snk and afterwards use signtool with your code signing certificate to do sign the DLL/EXE with the authenticode signature. While this seems strange, from what I understand this is a correct way to deal with certificates, because strong names have a different purpose than authenticode (see also this link for details on how this works). Import your certificate as KeySpec=2. The procedure for this is detailed here. Because I want to use multiple strong names, I currently use option (1), although option (2) also works. Using the "Certifiates" MMC export the existing keyset (KeySpec=1) to a PFX file. Note: Please backup this file to a safe location and test if the file can be imported ok on another machine if you really want to play it safe! Delete the existing certificate from the crypto store (stlll using the MMC). Enter the passphrase for the pfx when prompted. You now should have a keyset/certificate with KeySpec=2. If needed you can now export this into another PFX file using the MMC again. To resolve this problem in Visual Studio 2012, I right click the project, properties -> "signing", and then uncheck the "Sign the ClickOnce manifests". I reselected the Key(pfx) file in the "Choose a Strong Name Key File" drop-down box, Then provided password in the "ENTER PASSWORD" Popup Window. Saved my project and did rebuild.build succeeded. Click on the Signing section. Visual Studio will now prompt you for the password. Enter it. Save your project and do a rebuild. Enter the original password in all three boxes and click OK. If you’d like to change your password (or if your old password doesn’t meet complexity requirements), you can do so now. As a workaround, I tried running the Visual Studio 2010 as an administrator, and it worked for me. For one variant you use sn.exe (usually if you are doing strong naming) to import the key to the strong naming store. The other variant for which you use certmgr to import is when you're codesigning for things like click-once deployment (note you can use the same cert for both purposes). Nothing worked for me, but then I went and looked into the certificate manager (mmc.exe). The certificate was not imported in the personal store, so I imported it manually and then the project compiled. 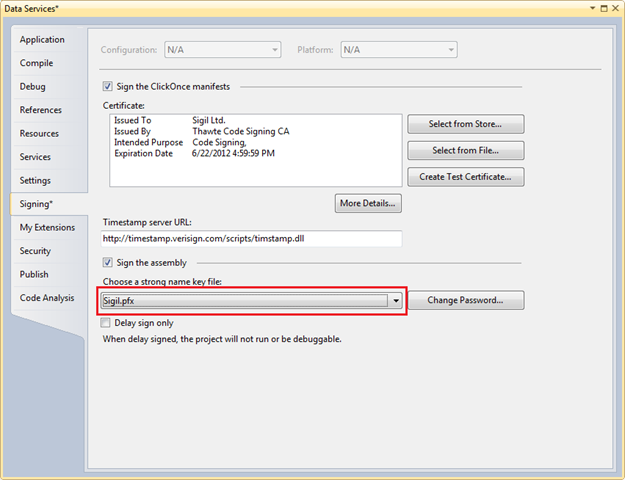 See ClickOnce Manifest Signing and Strong-Name Assembly Signing Using Visual Studio Project Designer's Signing Page, Signing Assemblies. 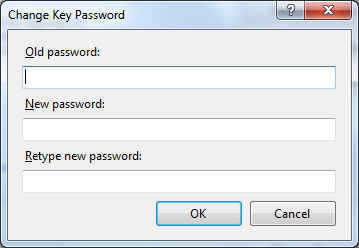 Reselecting key file in a combobox and entering password helps on this for us. But it is needed to do each time the key file changes and it seems to be not OK. I had the same problem after moving my Windows installation to an SSD. None of the other solutions worked for me. My solution was to open the project file in Notepad and remove all references to PFX keys. Once the file is saved, open the solution in Visual Studio. Go to project -> Properties -> Signing. You shouldn't see any keys listed in the 'choose the strong name key file' combo box. In the combo box, browse to the key, select it and your project can now be built. My problem was that the TFS Build Controller was running as a network service and for some reason I didn't understand why the Visual Studio Build Host service certificates were not being used. I changed the identity of the Visual Studio Build service to something more manageable, made sure it had rights on the TFS server, and manually added the certificates using the MMC. The problem was also that MSBuild can't add the password protected certificates to the store. All methods described here didn't help me. But when I deleted the *.pfx file from my project and added it to the assembly's signing again, I built my project with without any error! I can't explain reasons why. But it worked for me. Okay, this worked for me. 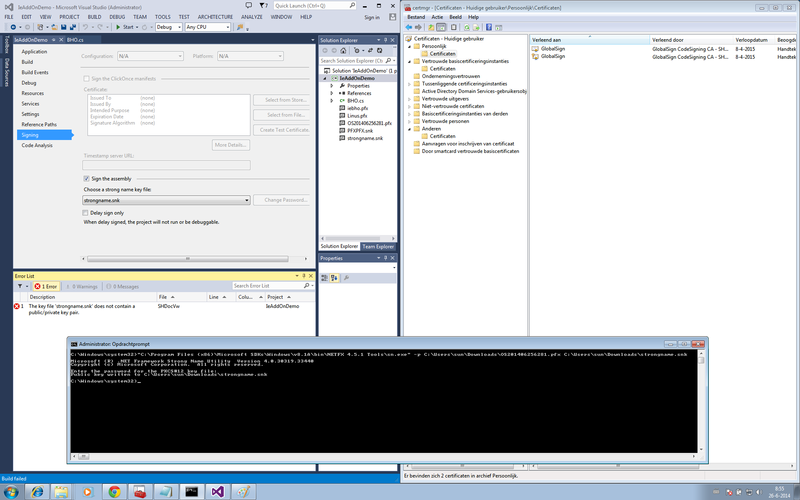 Open the old solution/project as an administrator in Visual Studio 2010 and open the new or copied solution/project. As an administrator, remove the copied pfk file in the new Visual Studio 2010 solution/project and go to project properties and unselect it. With both projects open, copy paste to the new one. Go to project properties and select Build. I opened and closed Visual Studio and also after removing from the new project built it before copying it from the old project and selecting it. I received the error at the start of this post first up when I copied the project and tried to build it. In my scenario the build service was not using the same user account that I imported the key with using sn.exe. After changing the account to my administrator account, everything is working just fine. Also, the "Sign the ClickOnce manifests" certificate information panel wasn't populated. I did "Select from File..." on my pfx, and it solved the problem. Changing the value to false made the error go away. I used the sn.exe with -p flag to the official code sign PFX file (purchased as code signing) as below which created SNK file and in Visual Studio 2013 that SNK file was browsed to be used. Which resolved the password problem. But still the problem is that it keep saying: "The key file *..SNK does not contain a public/private key pair." Not the answer you're looking for? Browse other questions tagged visual-studio-2010 visual-studio passwords pfx or ask your own question. Why am I getting “Unable to find manifest signing certificate in the certificate store” in my Excel Addin? How to manually set password for MSBuild sign target? What password does domain-protected pfx require?